It is a daunting thing to consider another school year, which to me means endless opportunities for the High-Life team to bring the light of the Gospel of the grace of Jesus Christ into what seem to be increasingly dark places. Students from all over North Alabama descend on our homes, on school campuses, and The Lodge. Brokenness abounds, true joy is fleeting, and the age-old issue of being unique (just like everyone else) remains. A true knowledge of God leading to a true knowledge of self is as difficult to cultivate as it has ever been. Many parents are on constant alert, desperately vigilant to guard against the next piece of spirit-breaking news. As it turns out, life is pretty hard. Please do not read doom and gloom from these words. There is hope in the darkness and difficulty because of Jesus. Southwood is set upon the mission of experiencing and expressing the grace of Jesus Christ to each other, to Huntsville, and to the world. At High-Life, we join with the apostle Paul in our desire to find light through “Christ in you, the hope of glory.” Our drive as a ministry is to “present everyone mature in Christ…struggling with all his energy that he powerfully works within” us (Colossians 1). Our primary push is toward the ideas of knowing and of being known. Many of the defining moments in my life, so far, took place between the ages of 13 and 18. The guilt and shame of my sins, the mountain peaks of my successes, the painful interactions with my peers, the friends that I can still call on a moment’s notice, were developed during this time. I did not need social media to create a portrait of myself to show off to the world. I have always been pretty good at trimming the fat and letting people see just enough of me to know that I am a different person, but enough of what I know that they wanted to see to have some hope of being accepted. face-to-face. Their best friend can break their confidence at school in a terribly painful way, but they will keep their 500-day streak alive on snapchat. A group of guys can be civil in public but can destroy one or many others with pictures, comments, and direct messages on Instagram. Broken homes, sexual brokenness, popularity struggles, depression, suicide, economic and social hierarchy, and racism are some bullet points on an seemingly endless list of real struggles. It is in these places that we can only hope for the power of Christ to “powerfully work” within us. Being known is an essential part of saving faith. The idea that God knows everything that we have ever done and everything that has ever been done to us is not something that is readily accepted. We then pile on the reality that, in spite of those things, he loves us with the passion of a perfect Father, eager to see his children know our identity through the perfection of our Elder Brother. “For our sake he made him to be sin who knew no sin, so that in him we might become the righteousness of God” (2 Corinthians 5:21). 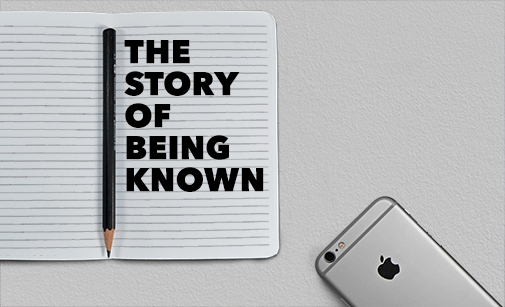 Being known is an undeniable aspect of being saved. Knowing someone else can be a bit more difficult. The act of knowing someone else requires the strong movement of the Holy Spirit. Psychologists and psychiatrists have long said that the breaking down of secrets is a key to disarming destructive behavior in individuals. While this is certainly true, it is of little eternal consequence. Knowing someone requires naming the dignity and the depravity in someone. It also involves taking those puzzle pieces and acknowledging the many wide and obvious gaps that keep that broken puzzle from ever being a complete person. We acknowledge the need of our Savior to cover the depravity with his righteousness, to seal the gaps with his goodness, and even to reconcile our dignity to the Father. As we sit with students and parents, we pray for the strong movement of the Spirit to enable us truly to know them and point them to Christ as the only solution to be made whole. We pray for the ability to be known by them in ways that show the faithfulness of God to his people. We tell stories from experience, and from the text of Holy Scripture, to the end of modeling what it means to have no shame in being known and no fear in knowing. In fact, principally know what we are to believe about God, and what duty God requires of us, through a Story — It is through the Bible, the story of God’s love for his creation, his love for his people, and the lengths to which he is willing to go to bring them to himself. In this story, we grumble, we complain, we argue that we know best, and yet God keeps his promises. We constantly choose against him and for destruction. In the midst of that, he calls us to himself. The tension between God’s sovereignty and man’s responsibility is palpable, but the Bible paints the picture of a loving Father who wishes for none to perish. So, to match the love of the story given to us by our Heavenly Father, High-Life is focused on telling the stories of what God has done in and for us. Our community is focused on the work of the Holy Spirit to be faithful to the text of Scripture and to the working out of salvation in the people of God. Our leaders share stories of what God has done in them in Sunday school, in small groups, at High-Life, and in other settings. We trust that the Holy Spirit works in believers individually, and amongst us corporately, to push us toward the Kingdom goals of our Father. That Advocate is present with us, actively bringing our community into alignment with the eternal purposes of the Creator God. The hard work of relational ministry can only bear fruit when the Gospel is dripping from the mature believers in the community. We cannot cultivate this in ourselves. We cannot use logic to penetrate the darkness of the situations with which we are faced. We humbly grasp onto the reality that we have been charged with the pushing of those in our charge toward maturity in Christ. “Him we proclaim, warning everyone and teaching everyone.” (Colossions 1) There is little that is tangibly measurable in this. We are players in a long game, while our students are pushing forward with a short-game mentality. And so, we strive, naming grace upon grace, to have the fortitude and boldness to stand as beacons of light in what can be a dark time in the lives of many. We name the need to be known by the One who chose us in Christ before the foundation of the world. We name the desire to know those who are hurting. We tell the stories of the faithfulness of our God, our Heavenly Father, who loves his children, that many would come to repentance and know His love.